As the much-despised villain bent on the destruction of the peaceful Smurfs of Smurf Village, Gargamel certainly hasn’t gained many fans for himself over the years. While his level of dedication is rather impressive, his goal to bring the sweet little Smurfs to ruin prevents many people from seeing him in any sort of positive light. There are, however, plenty of things that can be learned by watching Gargamel at work; here are ten of those lessons. Even Foul Plots Can Have Good Results – When Gargamel created the only female Smurf in history out of “blue clay, sugar and spice but nothing nice, crocodile tears, half a pack of lies, a chatter of a magpie, and the hardest stone for her heart,” he hoped to create an instrument of Smurf Village’s destruction. After a bit of help from Papa Smurf, she became the sweet and considerate Smurfette instead. Loneliness Makes People Behave Differently – Though he’s angry at the world and the Smurfs in particular, all Gargamel really wants is to have a friend. Kids can learn an important lesson about the perils of loneliness and the importance of being a friend from Gargamel’s plight. Greed Leads People Down the Wrong Path – Gargamel’s quest to destroy the Smurfs began as an attempt to use one to turn a base metal to gold in an alchemical procedure. His subsequent failures to secure the Smurfs and complete his project led to his determination to destroy them on principle, but it all began because of his greed. A Nickname Can Be Difficult to Get Rid Of – When Smurfette dubbed Gargamel “Gargy,” getting rid of the moniker proved impossible for the villain. It was later used as a taunt by Gargamel’s apprentice, Scruple. It’s Good to Have a Plan – Though they’re usually on the outlandish end of the scale, Gargamel always has a scheme in place. He knows the importance of a well-thought-out, cohesive plan. Good Posture is Important – The stooped, humpbacked posture that is Gargamel’s trademark is the result of a lifetime of bad posture. Children watching can learn the importance of maintaining good posture to avoid looking like Gargamel when they get older. Some People Even Hurt the Ones They Love – Some people are so cruel, they even hurt the ones that they love. Gargamel is no exception; young fans of the show are well aware of the fact that, despite his tendency to insult and berate him, Azazel is one of the few things Gargamel actually cares for. 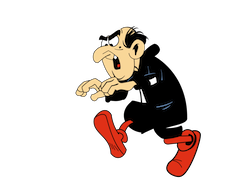 Persistence is a Virtue – Though his aims are quite nefarious and his means are downright dirty, the level of persistence and determination that Gargamel brings to the table is absolutely impressive. Though it’s important to harness these powers for good rather than evil, kids know that being tenacious could pay off big one day. Constant Defeat Can Change a Person – After so many years of defeat at the hands of the decidedly un-warlike Smurfs, Gargamel’s perspective becomes clouded and confused. Sometimes, he even views the Smurfs as friends or, at the least, no longer enemies. Alliances Can Be Tricky – On occasion, Gargamel will team up with another of the Smurfs’ enemies, only to find himself in very hot water when things don’t go as planned. The moral of the story: ganging up on people never has a favorable outcome. Again, we see that even the villains have lessons to teach. We just need to take the time to pay attention and choose to avoid their mistakes.